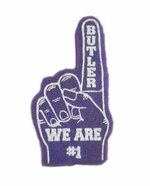 Mini Foam Finger Height 6"
Purple and tan canvas pennant mounted on a wood frame, "Butler" and the bear emblem imprinted on the front. Pennant can be either mounted to a wall or set on a shelf or counter. Dimensions: 29" long, 12" high decreasing to 1/4" at the point, 1 1/2" wide. This vintage wall sign adds just the right touch to any home. 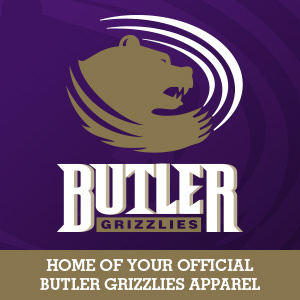 Imprinted with the Grizzly centered in purple and "Butler Grizzlies - Est. 1927" in white. Made with 1/2" MDF. Dimensions 11" X 18"
Silver and black photo album "Butler Community College" engraved in black on the lower front. Album contains 40 double sided sleeves that can hold photos up to 5 1/2" x 7". Overall dimensions: 8 1/2" wide, 6 1/4" tall, 1 3/4" deep. Silver shadow box frame, Butler "B" etched on upper right corner of the glass. Purple matting with 3 1/2" x 5 1/2" opening, "Butler Community College" imprinted on the lower front in white. Frame designed so can be hung on a wall or has a built in stand. Dimensions: 8 3/4" wide, 6 3/4" tall, 1 1/4" deep. White and purple hombre wrap ceramic mug with "Butler Grizzlies" and the bear logo.